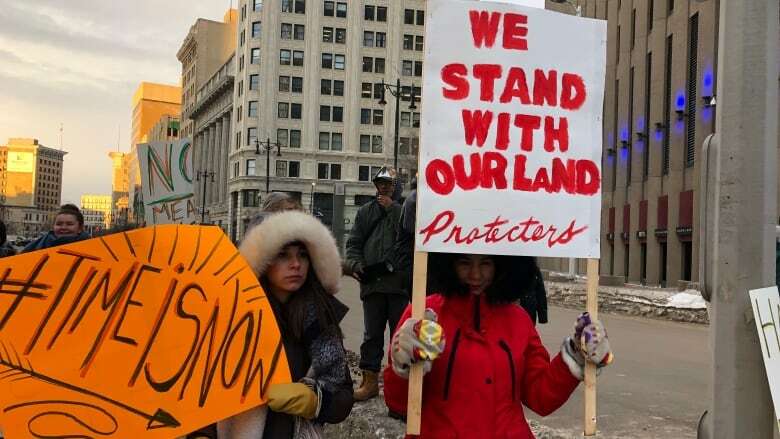 Winnipeg supporters rallied at Portage and Main Thursday, in solidarity with people from a northern B.C. First Nation whose fight to keep out pipeline workers has drawn national attention. 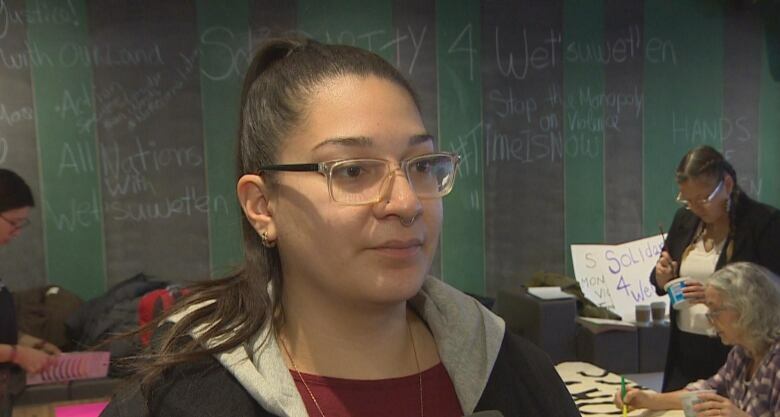 "The time is now," said Sadie-Phoenix Lavoie, who helped organize the Winnipeg rally. "We're frustrated and fed up, and enough is enough." The rally at the busy intersection was set to begin with a round dance at 4 p.m. Police said the intersection was reopened by around 5 p.m. Supporters met beforehand at the University of Winnipeg for what they described as an "artbuild" to make signs. 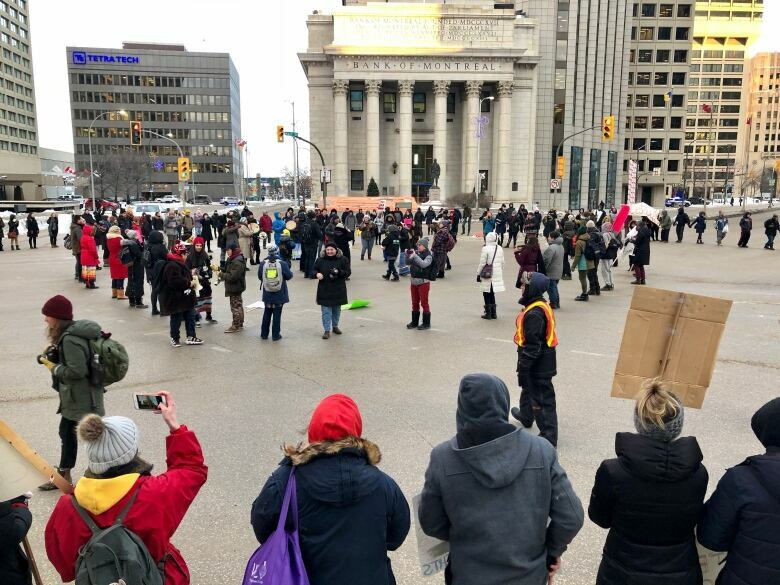 The event followed a 24-hour sacred fire at the Manitoba Legislature, which burned Tuesday and Wednesday in support of people from Wet'suwet'en Nation in B.C. Members of that nation have been blocking access to their traditional territory by Coastal GasLink pipeline workers with two camps, called Gidimt'en and Unist'ot'en, established along the forest service road with fortified checkpoints. On Monday, RCMP entered a fortified checkpoint on a forest service road near Houston, B.C., about 620 kilometres north of Vancouver. Police arrested 14 people. A tentative agreement was reached Wednesday to allow workers to access the territory by Thursday 2 p.m. Hereditary leaders said the move doesn't mean they're consenting to construction. During a Winnipeg visit Thursday, Crown-Indigenous Relations Minister Carolyn Bennett said the federal government wants to ensure the conflict doesn't set back reconciliation efforts. "I think we're all very grateful that the conversations have taken place and that the tensions have been reduced," she said. "I feel that we, as Canada, really have concerns that we are moving the project of reconciliation forward." 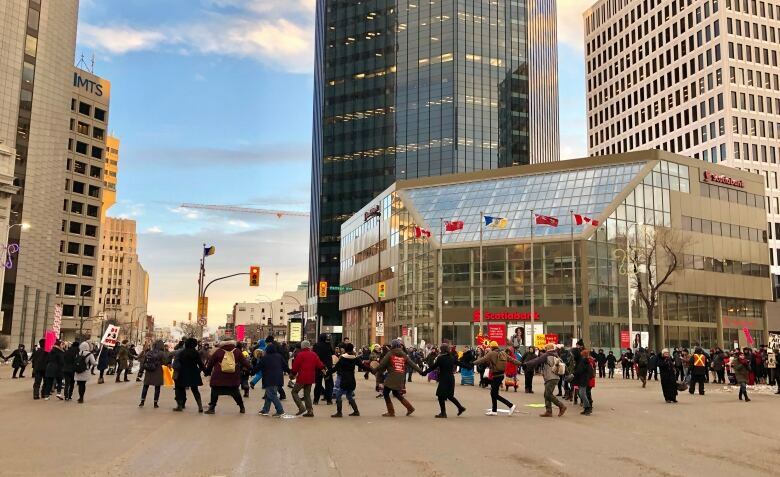 Before the Winnipeg rally started, police put out a news release warning the public of potential disruptions at Portage and Main due to the gathering. Officers and cadets would be at the scene, it said. Lavoie said the intersection is a fitting place for the rally because of the commuter traffic and the city's recent referendum decision not to open it to pedestrians. "It seems to be, you know, this big inconvenience for a lot of people. And ultimately, we're the ones that are facing the bigger inconvenience," Lavoie said. "I'm sorry, but there has to be some way to get your attention." The Monday arrests in Wet'suwet'en Nation spurred protests across the country. "I think it's a broader issue in terms of the relationship with Indigenous peoples, and the way that the Trudeau government is basically crocodile tears, saying, you know, 'I want this relationship with Indigenous peoples and it's important,'" Lavoie said. "But yet the actions that has happened shows really that he's … letting people get arrested for being on their own territory." The 675-kilometre pipeline, which would move natural gas from Groundbirch, B.C., to Kitimat, B.C., for international export was cleared by provincial officials by April 2016. It is owned by TransCanada Corp., which changed its name to TC Energy this week. The National Energy Board launched a multi-step process last fall to determine if the $4.8-billion pipeline should fall under federal jurisdiction and undergo further regulatory review. Lavoie said the issue should matter to people across Canada, because it speaks to the broader question of the relationship between Indigenous peoples and the Canadian government as well as environmental protections. "A lot of us don't have the means to travel and go to B.C., so this is our way of showing that we can still be supportive here in Manitoba," Lavoie said. "Young people, our future's uncertain, and that's why we're here acting today," she said. "We want what's best for the people, for Indigenous peoples, our relationship and for humanity, ultimately, when you talk about the broader question of climate change."